Serious games adoption is increasing, although their penetration in formal education is still surprisingly low. To improve their outcomes and increase their adoption in this domain, we propose new ways in which serious games can leverage the information extracted from player interactions, beyond the usual post-activity analysis. We focus on the use of: (1) open data which can be shared for research purposes, (2) real-time feedback for teachers that apply games in schools, to maintain awareness and control of their classroom, and (3) once enough data is gathered, data mining to improve game design, evaluation and deployment; and allow teachers and students to benefit from enhanced feedback or stealth assessment. 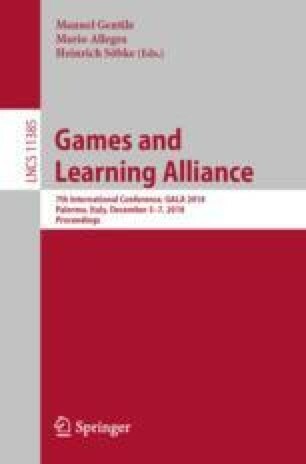 Having developed and tested a game learning analytics platform throughout multiple experiments, we describe the lessons that we have learnt when analyzing learning analytics data in the previous contexts to improve serious games. This work has been partially funded by Regional Government of Madrid (eMadrid S2013/ICE-2715), by the Ministry of Education (TIN2017-89238-R) and by the European Commission (RAGE H2020-ICT-2014-1-644187, BEACONING H2020-ICT-2015-687676, Erasmus+IMPRESS 2017-1-NL01-KA203-035259).